So when you’re participating in a 24-hour creative work blitz with the goal of staying up all night, you might want to leave your pajamas at home. Each year, TRIO has a theme for our annual CreateAthon. This year was no different. We were all excited that we were going to have a “slumber party” this year! Yes, a party with sleeping bags, junk food, face masks and comfy robes. What in the world were we thinking? It’s 4:16 a.m. and we are all using toothpicks to keep our eyes open. We have been so comfy all day that the reality of comfort set in hours ago (zzzzz). Don’t fear though. We’ll make it (we think). With just a few hours left, we’re proud to share a list of everything that we have been working on over the past 24+ hours (in no particular order). First up, East Cooper Land Trust. Many of us are Mount Pleasant residents and enthusiastically worked on a direct mail piece for this East Cooper nonprofit. We also provided social media recommendations to ensure their team makes the most out of the power of social media because spreading the word is so critical to their success. With the ridiculous growth in our town, we were honored to support their mission. If they come up in your news feed, support ’em! Then we moved on to Carolina Youth Development Center. They provide such an important service to dozens of our community’s most vulnerable children. The housing for these kids is in constant need of repair. So, we helped to recraft their donor packet to help their team gain more support from our community. If you, or someone you know, are interested in ensuring these kids have a roof over their heads, this is the nonprofit for you. Next, we shifted gears to Saint Francis Animal Center in Georgetown. Who doesn’t want to help puppies and kittens? We do and we did! First, we recreated their logo so they would have the necessary file formats for all their marketing needs. Then, we developed stationery and redesigned their brochure. We miss our fur babies from our first visit so we have our fingers crossed that we’ll be able to go back up and deliver their goods (generously donated by our BFFs at Nelson Printing). Then it was time to tell the story of Meals on Wheels of Charleston. They provide such a vital role in our community. Without them, so many of our seniors would be without a warm meal and someone to check on them. We were honored to create a brochure for them. If you have a heart for the elderly and have a good driving record, give them a call. They need drivers! What a great way to give back to the community – driving around our beautiful Lowcountry helping someone’s grandmother or grandfather. And last, but certainly not least, we donated our time and talents to Lowcountry Food Bank. 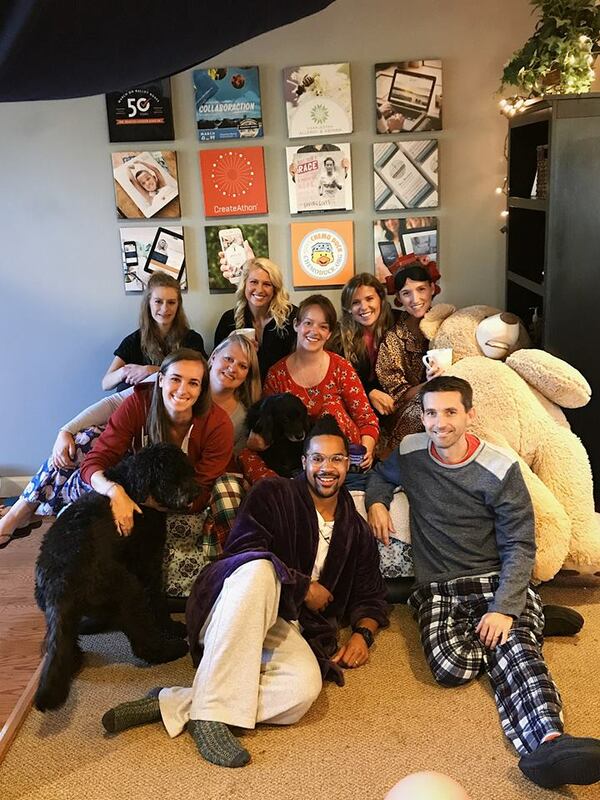 While we originally set out to develop a marketing plan, that task became quite a challenge because this group really does have their you-know-what together. Seriously, you have to be doing something right if you have distributed 28 million pounds of food to the community – yes that’s 28 MILLION! That being said, we wanted to help them tell their story, so we created a 1-minute overview video. Whoa, that’s a lot but it’s not all. In addition to our projects, each recipient will also receive a 2017 CreateAthon T0-Go kit packed full of all types of marketing tips, plus TLC on their websites (if needed), Google Analytics reviews and social media recommendations. And with that….we’re ready for bed. But before we sign off, we would like to say THANK YOU to our biggest cheerleaders! and of course our friends and families! We’d like to most definitely give a shout out to our CreateAthon curators, Caitlin Ramsey and Lindsey Lubanski, who transformed our office into a twinkling twilight slumber wonderland and kept us well-fed and entertained all day and all night! Until next time….Good night Lowcountry. Remember to work hard, enjoy life and make a difference.